Did your SSC or HSSC score go down as you expected in your recent FBISE exams? Don't worry. It has a solution. I have seen students who get a boost of 20 marks in their subjects because he was a confidant about his paper when he applied for the Federal Board rechecking paper. If you are confident too, you should avail this opportunity. There are a lot of myths around there that FBISE doesn't increase the marks, but it is not always the case. FBISE is better than any other boards of Pakistan, and it has strict rules and staff. Without wasting your time, let's dive in. 1. Are You Allowed to See the Answer Book? According to the FBISE rules, you can see the answer book to such extent only to recognize the answer book is yours. You are not allowed to see the whole answer book or recheck your own for recounting of marks. 2. When Can You Apply for Rechecking? You have 20 days from the day of the announcement of the result to recheck your paper. The sooner you apply for rechecking, the better. But for some reasons, you don't find time in these 20 days, you can have an additional 10 days if you write a letter to the Chairman of FBISE to recheck your paper. He may approve or disapprove depending on the reason you have. 3. According to the Rule, What Does Re-Checking Mean? It doesn't mean your answer book will be re-evaluated. It means the checker doesn't check your every question and assign a score to it. He just sums up. The grand total of your answer book is checked mentioned on the title page where you write your roll number, paper name, and date. The grand total of questions that are taken from the subjective and objective part of questions. It's checked to ensure there is no empty portion where you haven't been awarded marks. The answer book hasn't been changed or detached. The handwriting of the student matches with the rest of the questions and answer book portions. 4. What Is the Process of Rechecking When a Mistake Happens in Your Paper? When the Re-Checking Committee finds a mistake in your answer book, the report is sent to the Controller of Examinations. Later on, it is submitted for recommendations to the FBISE Chairman for approval. After he has approved, the Controller of Examination will correct the mistake happened, and reports to the Head Examiner. Later on, a revised mark sheet will be issued. The Rechecking Committee is formed every year separately for SSC and HSSC examinations. 5. What Will Be Considered in Rechecking: Increased or Decreased Marks? Your recent marks will be considered even your marks get increased or decreased. It means if you have got 60 marks in Chemistry, and you apply for rechecking of paper, you may get 65 or 55. But don't let this fear to overcome you for not applying for rechecking of paper. For this reason, rechecking is worth the risks. 6. Is My Money Refunded If Mistake Found? Yes, your money will be refunded if a mistake is found in your answer book. It means if your marks increased or decreased, you would be refunded. 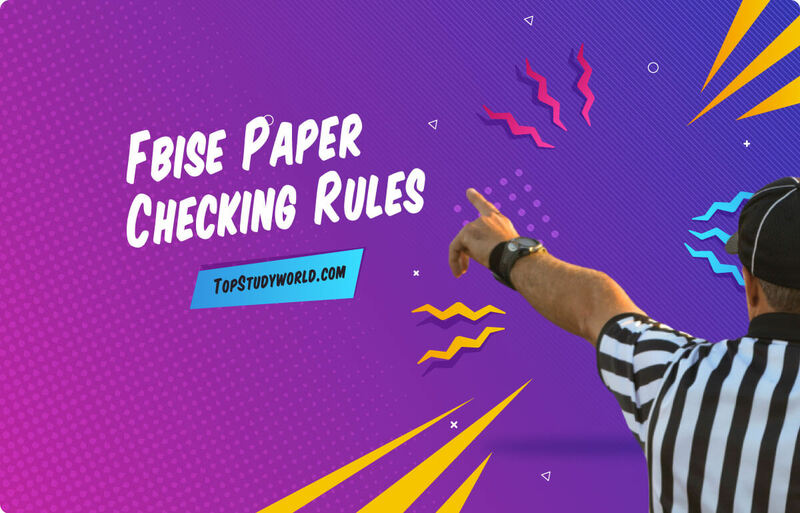 When it comes to applying for rechecking, it is important to know the FBISE rechecking rules. Here you can read in easy wording.